Perfect for pruning or weeding jobs, the Fiskars Kangaroo 30-gallon gardening container holds itself open, freeing your hands for work. The Kangaroo's unique spring design springs up to a 22-inch diameter, 30-gallon capacity, just waiting to be filled with weeds, pruned branches, or raked leaves. When you're done, the container can be collapsed and stored easily in a compact, ready-to-hang 3-inch stack. 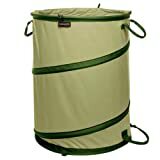 The heavy-gauge vinyl construction is tear and mildew resistant, and the Kangaroo fits standard 30-gallon garbage can liners. The container weighs just 4-1/2 pounds. This item does not come with hard plastic bottom.